An excellent presentation was posted on Youtube on 12 February 2017 (try this if the first link doesn’t work). Just 22 minutes long, it is well worth a watch. The speaker, Professor Salim Yusuf, is a Canadian physician. He is also the president of the World Heart Federation. In this video he presents a compelling argument that our dietary guidelines on fat, saturated fat, salt, fruit and vegetables are just plain wrong. Welcome to the party! The main and common error, made by Yusuf and many others, is that ‘the straight line that was fudged’ was nothing to do with the Seven Countries Study. I’ll go through where this graph came from and how we came to know about the ‘fudging’. The graph, which is commonly referenced incorrectly, is shown below. This graph was first presented by Ancel Keys at a symposium at Mount Sinai Hospital, New York, in January 1953. The graph was published later that year, presented as Figure 2 in a paper entitled “Atherosclerosis: a problem in newer public health” (Ref 1). This was Keys’ first presentation of a graph of the relationship between mortality from degenerative heart disease and fat calories as a percentage of total calories in the diet for a number of countries, for men aged 45-49 and 55-59 (Fig. 2, p134 of Keys’ paper). 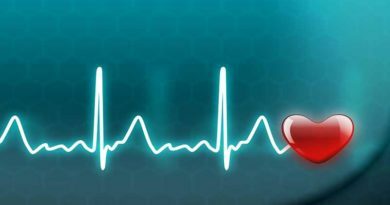 Degenerative heart disease was defined as coronary disease, angina pectoris, infarction, chronic myocarditis and myocardial degeneration. Keys presented the graph with data for Australia, Canada, England and Wales, Italy, Japan and the USA. The six data points suggested a strong relationship between fat calories as a percentage of dietary intake and deaths from heart disease for men aged 55-59. Keys concluded from the above: “Whether or not cholesterol etc., are involved, it must be concluded that dietary fat somehow is associated with cardiac diseases mortality, at least in middle age (p.134)” (Ref 1). Keys presented his graph of six countries with the explanation “So far it has been possible to get fully compatible dietary and vital statistics data from 6 countries” (p.133) (Ref 1). This was refuted by Hilleboe (Ref 2) , who presented Yerushalmy’s data for 12 countries for heart disease and calories derived from fat in the diet and then by Yerushalmy and Hilleboe in their co-authored 1957 paper, which presented data for 22 countries (Ref 3). Yerushalmy and Hilleboe (Y&H henceforth) set out “to investigate the association between dietary fat and heart disease mortality in all countries for which information is available” (their emphasis). Y&H’s findings are shown in the graph below. Data are available for males aged 55 to 59 years in 22 countries, not 6. Y&H concluded: “It is immediately obvious that the inclusion of all the countries greatly reduces the apparent association” (p.2345) (Ref 3). That’s where the ‘fudging’ was done and exposed. It’s a shame it took so long for the rebuttal (1957), after the original presentation and paper (1953). Keys responded to the Y&H critique. His response was published as an editorial in the Journal of Chronic Disease (Ref 4). But the debate was essentially over by the end of 1957. (I’ve put the details of the debate between Keys and Y&H as a post script at the end for those who like the full Monty. There were some really interesting findings made by Y&H and Professor Yudkin joined in to amusing effect). The Seven Countries Study started in 1956 in preparation and 1958 in practice. The Y&H critique of the Mount Sinai presentation graph thus came during this start-up period. 16 cohorts within 7 countries were chosen: the USA (1 cohort), Finland (2), the Netherlands (1), Italy (3), the former Yugoslavia (5), Greece (2), and Japan (2). 12,770 men, aged 40-59, were studied across these 16 cohorts. The findings of the Seven Countries Study were not published until 1970 (Ref 5). One of the key researchers involved in the study, Henry Blackburn, acknowledged that “The study has been criticized for the method in which populations were selected for the study” (p.2) (Ref 6). 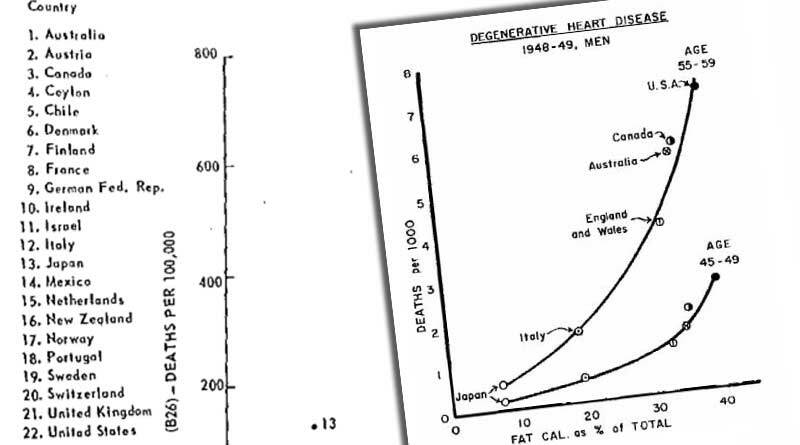 The key criticism that can be made of the Seven Countries Study, as a result of the Mount Sinai presentation, was that Keys knew from the 1953 graph that, if looking at heart disease in middle aged men, Japan would anchor one end of a line, the USA would anchor the other and Italy was positioned nicely on the line. If you look at the Y&H 22 countries scatter diagram, you can see that Finland (7) and the Netherlands (15) would add support to the Keys line. Only two of the seven countries, Greece and Yugoslavia, were absent from the available data and thus possibly an unknown risk for Keys. A book written in tribute to Keys for his 90th birthday documented that many of the countries were chosen because researchers were known to be examining similar issues to Keys: Martti Karvonen in Finland; Flaminio Fidanza and Vittorio Puddu in Italy; Ratko Buzina and Bozidar Djordjevic in what was known as Yugoslavia; Christos Aravanis and Anastasios (Andy) Dontas in Greece; Noboru Kimura and Hironori (Hiro) Toshima in Japan; and Frans Van Buchem and Louise Dalderup in The Netherlands (p.11) (Ref 7). Keys had collaborated with Buzina, Fidanza, Karvonen and Kimura prior to the start of The Seven Countries Study. It was a bit of a “mates working together” study, therefore and not one in which there would be many surprises. Not many people know this – the Seven Countries Study rejected the idea that total fat was related to either cholesterol levels or heart disease. In 1953, Keys thought that “Whether or not cholesterol etc., are involved, it must be concluded that dietary fat somehow is associated with cardiac diseases mortality, at least in middle age.” A conclusion no doubt reached following the selective inclusion of data (fudging). 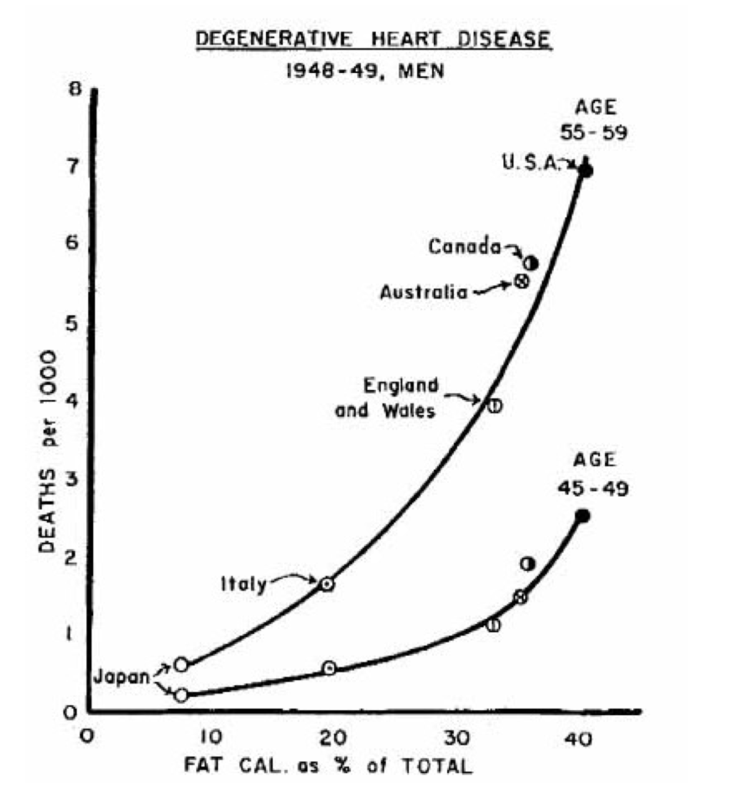 By 1970, Keys no longer thought that total fat and heart disease were even associated. The Seven Countries Study concluded that saturated fat was the single dietary culprit in heart disease. This is another reason why, seeing the Mount Sinai graph for total fat, presented as a finding from the Seven Countries Study, demands correction. The Seven Countries Study (1970) didn’t fudge any straight line graphs. A graph from a 1953 presentation and paper presented data for 6 countries, when data for 22 countries were available. This was naughty – or “academic mischief”, as I referred to it during my testimony at the Professor Noakes hearing. If you see this being wrongly presented, please enlighten the presenter. The real food side is mainly the one that criticises Ancel Keys. In some circumstances this is justified, but by no means all. We do ourselves no favours when we criticize Keys without noting the brilliant work that he did and especially when we get things just plain wrong. 3) Dietary fat intake and other causes of mortality. On (1), Y&H presented a strong case that additional categories of heart disease should have been included and that this would have made a notable difference for Chile, Mexico and France especially. On (2), Y&H reported that, when all data were examined, there were stronger relationships (correlation coefficients) than the one between dietary fat and heart disease. Y&H said that the relationship was stronger for the proportion of calories from animal protein and heart disease mortality (0.643) than for the proportion of calories from fat and heart disease mortality (0.587). On (3), Y&H examined relationships between fat, protein and carbohydrate in the diet and causes of death other than heart disease. The relationship for the proportion of calories from fat and causes of death other than heart disease was minus 0.657. This meant that a higher proportion of dietary fat was correlated with lower mortality from causes other than heart disease. There was also a negative correlation for the proportion of calories from animal protein and mortality from causes other than heart disease (-0.405). Y&H did not comment upon the strongest positive relationship that I observed in their table IV (p.2350) (Ref 3): The proportion of calories from carbohydrate had an r value of 0.671, in correlation with mortality from causes other than heart disease. Y&H’s conclusion was that the evidence from 22 countries for which data were available invalidated the claimed association between the proportion of fat calories available for consumption in national diets and deaths from heart disease. They found that the association was not specific for dietary fat or for heart disease mortality. Y&H described the claimed association as “tenuous” and one that could not serve as much support for the hypothesis which implicated fat as a factor in heart disease (p.2351) (Ref 3). 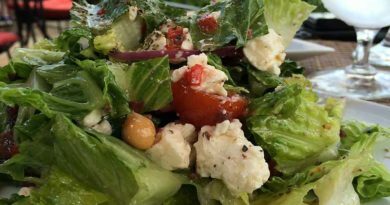 Y&H suggested that a more plausible explanation was that the dietary factors, which appeared to be positively related to heart disease, were a reflection of national income. They proposed that the amount of fat and protein available for consumption was an index of a country’s development, industrially, nutritionally, medically and no doubt in other respects as well (p.2350) (Ref 3). I explored this hypothesis in my thesis (Appendix 1 – data were available for 20 of the 22 countries examined by Y&H). I found a clear relationship between Gross Domestic Product (GDP) and fat as a proportion of the diet and GDP and deaths from heart disease. GDP could indeed have been the confounder, therefore. (Better off citizens eat richer food and better off citizens die from heart disease). Professor John Yudkin thought the same. Yudkin proposed that there was a better relationship with intake of sugar than with any other nutrient examined. In parallel with Y&H, Yudkin also proposed that heart disease was associated with higher living standards. “This is supported by the relationship which exists between coronary mortality and national income per head (fig. 11)” (p.158) (Ref 8). Yudkin reported “By far the best correlation I have found with trends in coronary mortality is in the number of radio and television licences (fig.24). There is nearly as good a correlation with the number of registered motor-vehicles” (p.159) (Ref 8). While amusing observations, both support the idea that income/development of a country was a key factor in the incidence of heart disease. Keys’ response to the critique of Y&H was published as an editorial in the Journal of Chronic Disease (Ref 4). Keys first defended his use of the definitions of heart disease chosen. Keys’ second argument was that deaths in one period should be compared with the diet of an earlier period. The example given was that, for deaths in 1950-1952 the critical age period might be in the middle 40s. Keys criticised Hilleboe’s review of 12 countries for using dietary data for 1954, an average of 3 years after the mortality data. Keys’ graph of 6 countries (Ref 1) used mortality data from 1948-49 and food balance data for 1949, so this criticism could similarly apply. 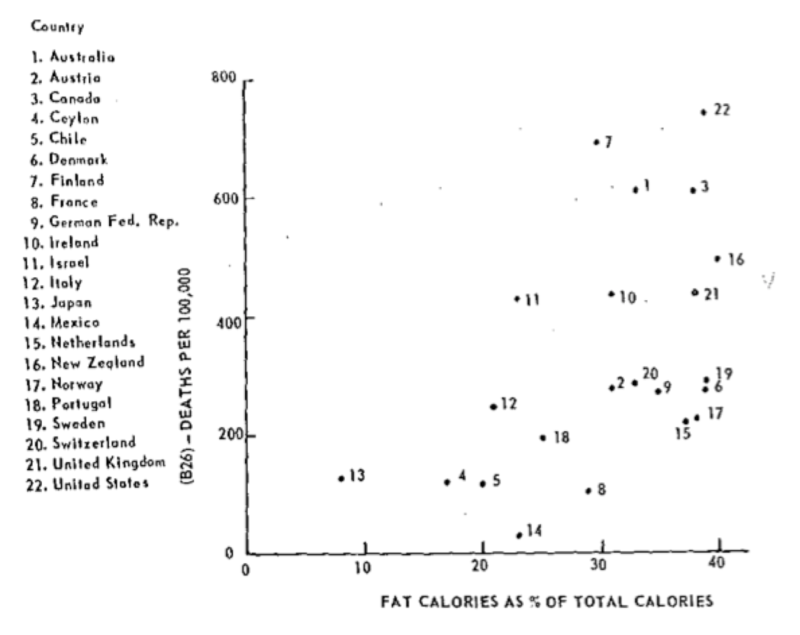 Keys also challenged the validity of Y&H’s dietary data, which was based on national average diets (p.557) (Ref 4). This argument was undermined by two factors: i) the same Food and Agricultural Organsiation (FAO) data was used by Keys, just for fewer countries and ii) Yerushalmy and Hilleboe did find a relationship between dietary fat and deaths from CHD. Their argument was that a) there was a stronger correlation with animal protein and heart deaths than dietary fat and b) causation had not been established (Ref 3). Keys response to the association vs. causation issue was the statement: “I doubt that Dr. Hilleboe really believes he has adequate evidence to state that there is not a causal relationship between dietary fat and the tendency to develop atherosclerosis in man” (Keys’ emphasis) (p.552) (Ref 4). Another criticism of Keys was that he was arrogant, blunt and dismissive and did not like challenge from friends or foes. This sarcastic quotation, in an editorial responding to serious academic allegations, is a useful example of his character. 1. Keys A. Atherosclerosis: a problem in newer public health. J. Mt. Sinai Hosp. N. Y. 1953;20(2):118-39. 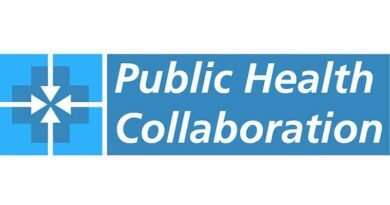 (The PDF can currently be seen here http://www.wisenutritioncoaching.com.au/wp-content/uploads/2013/07/Keys-Atherosclerosis-A-Problem-in-Newer-Public-Health.pdf). 5. Keys A. Coronary heart disease in seven countries Summary. Circulation 1970;41(I-186-I-195) doi: 10.1161/01.CIR.41.4S1.I-186 [published Online First: Epub Date]|. 6. Blackburn H. On the trail of heart attacks in seven countries. University of Minnesota, 1995. 7. Kromhout D, Menotti A, Blackburn H. The Seven Countries Study: A scientific adventure in cardiovascular disease epidemiology. The Netherlands: Brouwer Offset bv, Utrecht, The Netherlands, 1993. ← Is brown bread better than white? If it had, mayhap the data collected could contain significant differences. Some of the other countries had similar or different problems. Y&H did indeed find a correlation between heart disease deaths and fat, just not such a strong one as Keys found. You are very correct. What should be noted is that perhaps the reason why animal protein correlated stronger is because it looked at total fat and not saturated fat specifically. Since saturated fat is mostly found in foods of animal origin it is likely animal protein closely correlated with saturated fat, better than it did with total fat. This is supported by the fact that animal fat was associated with b-26 and vegetable fat was not, although French data was lacking. Many thanks for this – I tried to summarise the K vs Y&H exchanges – the detail that got in to (sounds like you’re familiar with it) was quite something on which defs of heart disease should be included and which countries tended to report one condition as another. Love them! Fact 1 – every food that contains fat contains all 3 fats – saturated, mono and poly. There are no exceptions. Fact 2 – the only food group with more sat than unsat fat is dairy products. Comparing animal fat and vegetable fat tells us little about total fat, sat fat, mono or poly and we’ve got to STOP thinking sat fat = animal and unsat fat = vegetable. It’s untrue and unhelpful. People can have a vegan vs paleo debate by all means, but fat does not divide along party lines. You are correct that nearly every food contains PUFA, MUFA and SFAs. However, the ratios are completely different. We’ll see that 100 grams of walnuts contains 9.4 grams of saturated fat. (Nutrition information both from the NCCDB) whereas butter will get you 62.2 grams of SFAs. Those are extremes but chicken will get you 28.1 grams of SFAs. Still three times more than walnuts. My point being that to what we’re comparing these foods is extremely important. When we make dietary recommendations for consumers to reduce their consumption of saturated fat, a reduction in consumption of animal products and processed foods is a good place to start. As your blog post pointed a reduction in the latter would also yield additional benefits due to the other unhealthy nutrients found in processed foods such as sodium and refined carbohydrate. In summary I agree with fact 1, but I don’t think that is necessarily saying much. As to fact 2, we must not only create healthful dietary guidelines that would benefit consumers, just as important is to make these guidelines understandable and easy to incorporate. I think choosing vegetable sources of fat accomplishes that. When we look at associations those consuming less of A will consume more of B or C. When looking at the health effects of A we must not forget to look at what’s replacing those foods. Keys’ research played an important role in our understanding of diet-heart. Saturated fat and thus many animal foods, not all obviously, do raise serum cholesterol concentrations. Replacing foods rich in saturated fat with PUFA or minimally processed carbohydrate will have favorable effects on LDL cholesterol. I think the metabolic ward studies show beyond any doubt that replacing SFAs and trans fatty acids with these lowers LDL. I realize that this is all slightly off-topic, for which I apologize. I make exactly those point in the presentation shared – with 100g of each of some products – lard is one of my faves – mostly unsaturated fat – single biggest fat is mono. We can have a heated agreement on fats in food. The Dietary Guidelines for Americans documented the sources of saturated fat in the American diet (fig. 3-4, p.26) . Pizza, desserts, candy, potato chips, pasta, tortillas, burritos and tacos accounted for 32.6% of saturated fat consumed in the diets of US citizens aged 2 years and older. 9.3% of dietary saturated fat came from sausages, frankfurters, bacon, ribs and burgers. 12.8% came from chicken and mixed chicken dishes, beef and mixed beef dishes, and eggs and mixed egg dishes. A further 24.5% was unaccounted for and collated as “All other food categories”; likely including, if not predominantly being, processed foods. The natural foods listed were cheese, milk, butter, nuts and seeds, which collectively accounted for 20.8% of saturated fat intake. It would have been ideal for unprocessed chicken, beef and eggs to have been separated from processed meals containing these ingredients. The diagram presented in the Dietary Guidelines is clear nonetheless. Processed foods account for the majority of saturated fat intake in the diets of Americans. The UK classification is similar. The Family Food Survey (table 2.4, p.18) documented sources of saturated fat in the UK diet . Bread, cakes, buns, pastries, biscuits, cereals, confectionery and other processed foods accounted for 33% of saturated fat intake. Milk, cream and cheese accounted for 24% of dietary saturated fat. Processed meat accounted for 16% of saturated fat intake, while unprocessed (carcass) meat was 5%, fish 1% and eggs 1% of saturated fat intake. Fats and oils made up the remaining 19% (99% due to rounding errors). As with the US, processed food accounted for the majority of the saturated fat intake of the UK.